A refinery in Anacortes, Wash. In 2016, voters in Washington state rejected an initiative that would have taxed carbon emissions from fossil fuels such as coal and gasoline. The most recent push for a carbon tax comes from a stalwart group of Republicans, including James Baker, George Shultz and Henry Paulson. Their new group, called the Climate Leadership Council, met with Gary Cohn, a top Trump top economic adviser, earlier this month to make their case for a plan that would tax carbon emissions, pay dividends to taxpayers and roll back Obama-era climate change regulations. Selling that idea to Trump — except for the part about killing off regulations — is a tall order. Trump has forcefully argued for more energy production, including coal, the dirtiest of the fossil fuels. But the idea of a carbon tax has a strong and surprisingly enduring appeal to some conservatives, even major energy companies such as Exxon Mobil. Here's one reason why: The carbon tax they're backing is revenue-neutral, meaning it wouldn't send any additional dollars to the federal government. But it's still a tax, and Republicans really dislike taxes. That may be the reason the Climate Leadership Council's plan is artfully called "The Conservative Case for Carbon Dividends." "Mounting evidence of climate change is growing too strong to ignore. While the extent to which climate change is due to man-made causes can be questioned, the risks associated with future warming are too big and should be hedged. At least we need an insurance policy." Here's how the insurance policy would work. Carbon emissions would be taxed "at the first point where they enter the economy," so, for example at a coal mine, a well or when oil arrives at port on a shipping container. Or the tax would kick in when the oil is refined. But not when the emissions come out of the tailpipe of a car. The tax would start at $40 a ton and expand over time. As the price of carbon-based energy increases, American taxpayers would receive dividends to offset those costs. Once the tax and dividends are firmly in place, the ax would come down on the Environmental Protection Agency's authority to regulate emissions. And the Obama administration's Clean Power Plan to curb carbon emissions from power plants would be eliminated. 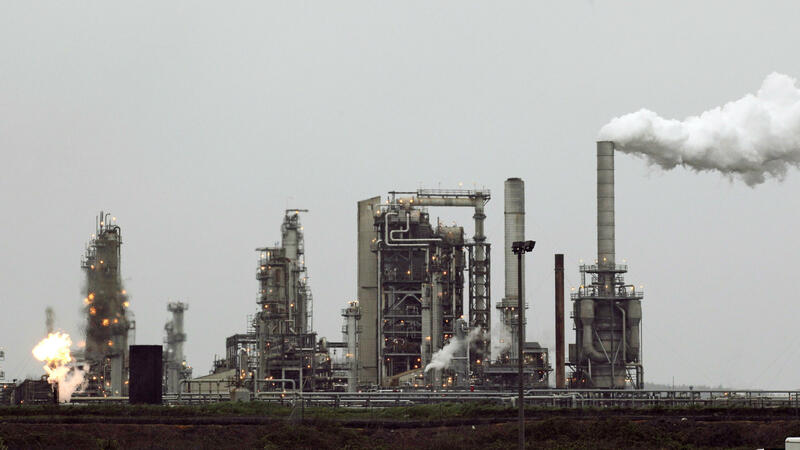 Last week, Darren Woods, the new CEO of Exxon Mobil, expressed his support of a carbon tax. In a blog post, he wrote: "A uniform price of carbon consistently across the economy is a sensible approach to emissions reduction." That a company like Exxon Mobil would get behind paying a tax on its core product is less surprising than it appears. It's better from Exxon's perspective than dealing with a mounting pile of regulations. Paying a carbon tax could relieve legal pressure and the reputational damage to energy producers over their role in contributing to climate change. And, the carbon tax would shift more electrical production from coal to gas. Exxon Mobil is the country's largest producer of natural gas. But despite such heavyweight corporate and establishment political support, the idea of a carbon tax probably isn't going anywhere — at least for now. Many Republicans will balk simply because it is a tax. Opposition will come from coal country. And even progressives and environmentalists might fight the proposal, even though it directly taxes the fossil fuels contributing to climate change. That's exactly what happened in the state of Washington last year. A wide range of environmental and social justice groups fought against a carbon tax initiative because it didn't direct revenue to projects such as alternative energy or affordable housing. Instead, it was revenue neutral, with rebates going to low-income families. The ballot initiative was soundly defeated.